Is this movie good.. My older cousin and her sister are gonna take us with them tonight..Is it good? 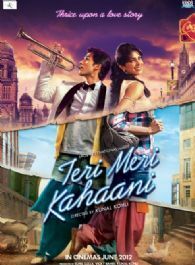 Unfortunately, I can not go to Teri Meri Kahaani But I really want to buy a ticket for the cinema and I want to give a gift for a child who can not go to cinema How can I do this? omg im sooo excited for ur new movie waiting !!!!!! is there a forum for this?? I have waited so long for this, I all excited, they share the best chemistry! Really love them, and they are just so talented.